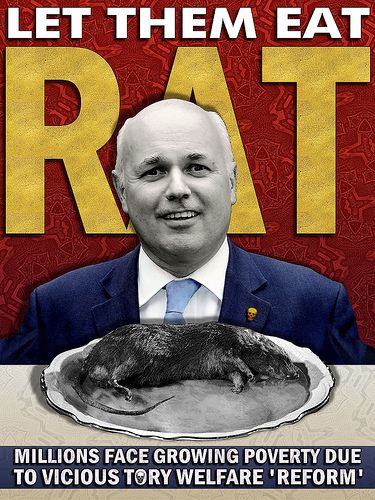 The Age of Austerity: Fighting Cuts and Privatisation — The proliferation of food banks! ‘A mother walks four and a half miles through the snow to a food bank for some handouts to feed her family. With her are two small children, their shoes full of holes. She has put plastic bags around their feet so that they are at least shielded against the wetness, if not the cold.’ This is not a sentence from one of Charles Dickens’ novels. This is a real story in 21stcentury austerity Britain. 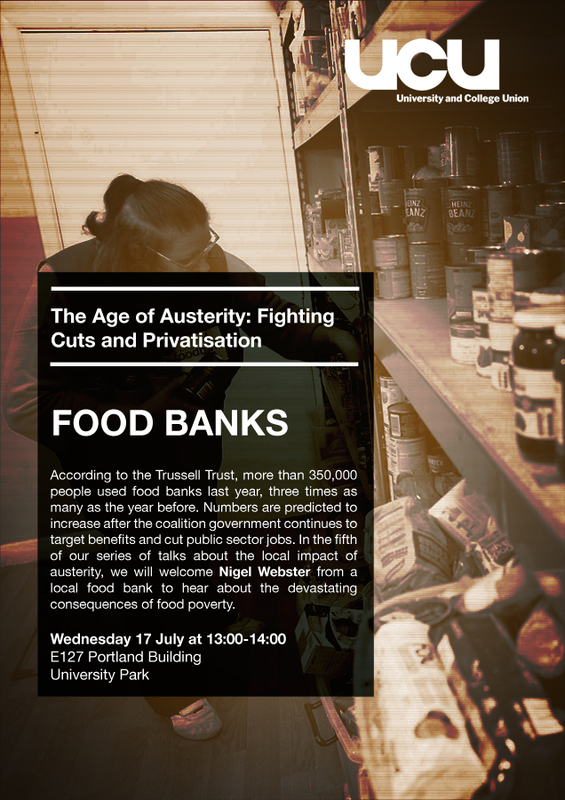 In the fifth session of the series on the local impact of austerity policies, the UCU association at Nottingham University welcomed Nigel Webster, the Director of the Bestwood & Bulwell foodbank, for a talk about the proliferation of food banks in and around Nottingham. The Bestwood & Bulwell foodbank, Nigel explained, is part of The Trussell Trust, which currently runs a network of over 325 food banks across the country. In greater Nottingham alone there are five food banks linked with The Trussell Trust, i.e. a third of the overall 15 food banks operating in the area. The Bestwood & Bulwell foodbank works closely together with frontline care professionals such as doctors, social workers and job centre officials, who give vouchers to people in need. These vouchers, in turn, can be exchanged for three days of food at the food bank. The general idea is to provide people with help for emergencies. The objective is not to provide permanent assistance. In general, everyone is entitled to a maximum of three vouchers. With 13 million people living below the poverty line in 21st century UK, it is no surprise that food banks are in high demand. According to the Trussell Trust, ‘in 2012-13 foodbanks fed 346,992 people nationwide. Of those helped, 126,889 were children’ (The Trussell Trust). Since the food bank opened in Bestwood and Bulwell last September, 1550 people were fed. People need to go to food banks for a whole range of different reasons including redundancy or not having enough hours of work, illness, debt, unexpectedly large bills, etc. The biggest reason, however, Nigel made clear, were changes to, and problems with, the welfare system. 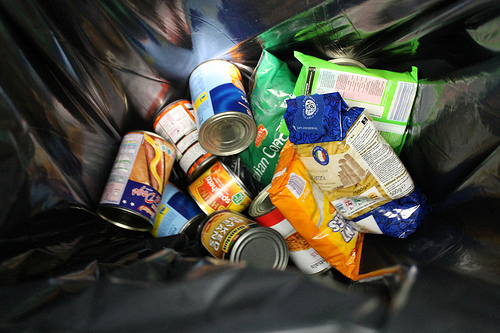 The Bestwood & Bulwell foodbank collects information about the people it helps and 40 per cent of all people come as a result of problems with the welfare system. People having their benefits withdrawn or cut by job centres often have no alternative than to go to a food bank in order to feed themselves and their families. Underneath these figures are a wide range of different individual tragedies. One of the people coming to the Bestwood & Bulwell foodbank describes himself as ‘existing, but no longer living’. Many do not consider themselves anymore as a member of the human race, reported Nigel. A whole group of people is increasingly excluded from society. Out from the stream of human misery encountered in food banks emerge the contradictions of our society. For example, on the one hand local businesses are very supportive and supply the food bank with goods. On the other, the food bank assists some of the employees of these businesses, because they do not have enough hours of work to make ends meet. In general, the overwhelming majority of food, 90 per cent plus, comes from the local community (schools, churches etc.) and members of the public, rather than businesses. Is it a coincidence that first thoughts about establishing a food bank emerged two years ago, the time when the first cuts to the welfare system by the current government started to bite? Unsurprisingly, with every further round of cuts the demand for assistance has gone up. Equally troubling is, according to Nigel, that due to the forthcoming holiday period, many children who are entitled to free school meals, will have one meal less per day over the weeks in summer. He expects demand to go up as a result. During the discussions, the issue was raised whether food banks would step in and take over responsibilities, which were really the government’s obligations. Does one not let the state off the hook by providing welfare services, which the state no longer offers? Are food banks perhaps ultimately counterproductive as they fill gaps rather than pushing for change, which would make them superfluous in the first place? In his final comment, Nigel, himself a lay minister of the Anglican and Methodist Churches in Bestwood, made clear that for a Christian it was absolutely essential to help people in need. At the same time, however, he pointed out that with mercy comes justice. The demand for change has to accompany the help for others. Charity on its own is not enough.